EKP 5.0 makes it possible to search EKP's course catalogs directly from the search box of Internet Explorer 7 or Firefox 2. When a user visits EKP using Internet Explorer 7, the drop-down arrow of the search box "lights up" to indicate that EKP has been added to the drop-down menu. To add the EKP search provider, select Add Search Providers from the drop-down menu, then select Enterprise Knowledge Platform by NetDimensions. Internet Explorer will prompt you to confirm that you want to add the search provider. 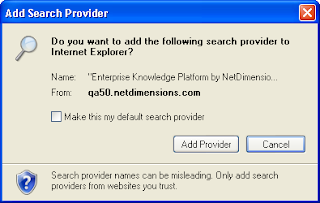 After clicking Add Provider, select Enterprise Knowledge Platform by NetDimensions from the drop-down menu. With the EKP search provider selected, initiating a search from Internet Explorer's search box opens EKP's catalog search results page directly. Similarly, when a user visits EKP using Firefox 2, the drop-down arrow of the search box "lights up" to indicate that EKP has been added to the drop-down menu. 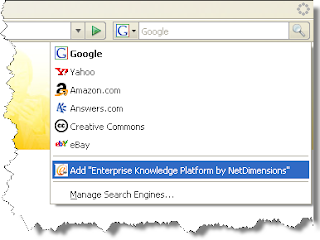 To add the EKP search provider, select Add "Enterprise Knowledge Platform by NetDimensions" from the drop-down menu. With the EKP search provider selected, initiating a search from Firefox's search box opens EKP's catalog search results page directly.